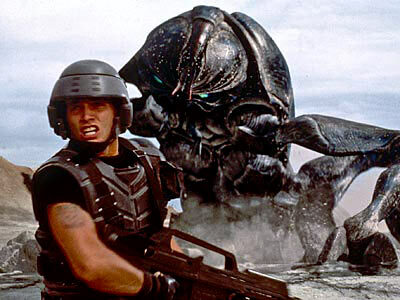 Description: STARSHIP TROOPERS, 1997, Sony Repertory, 129 min. Dir. Paul Verhoeven. This underrated sci-fi masterpiece is a dark political satire about an overly-militarized world, disguised as a violent space opera. Campy, melodramatic rock-jawed heroes (Casper Van Dien, Parick Muldoon), Archie and Jughead type (Neil Patrick Harris, Jake Busey) and sexually aggressive amazons (Dina Myer, Denise Richards) cavort in the fascist future fighting intelligent, insectoid monsters. Discussion after the film with director Paul Verhoeven. Join Verhoeven in the lobby at 6:30PM for a booksigning of his Jesus of Nazareth.